I love co-creating a dance that is unique and special and captures who you are as a couple. The point of the day is to celebrate your love and your first dance should highlight this! Want to do more than the middle school sway? Learn how to do elegant turns and classic dips and feel confident on the dance floor during your first dance as a married couple. Want to do something fun and different? We can teach you dance styles from Salsa and Hip-Hop to basic swing and waltz to impress your guests and kick off the dance party! Tell us your vision and together we’ll create a special one of a kind dance. Want to wow your guests? Kick off the dance party and get the reception going with a bang? 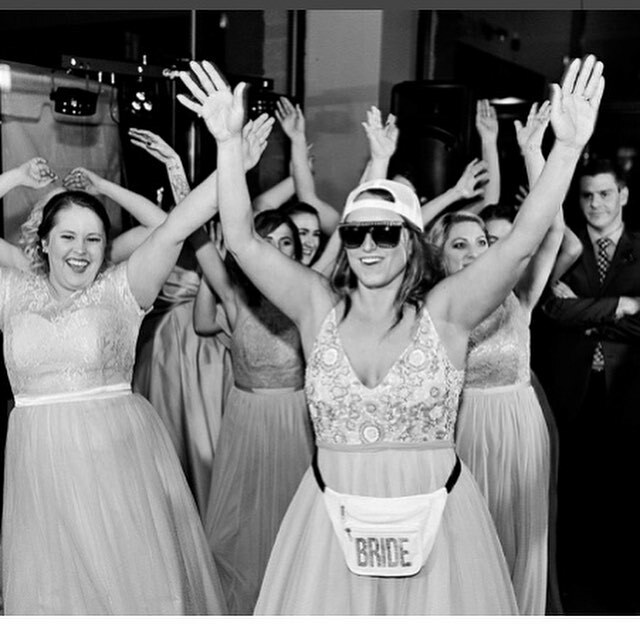 Doing a surprise dance with your wedding party is the perfect way to start the evening off. Is your wedding party out of state? No worries, we can choreograph a simple, fun routine for your friends to learn remotely via video. What better way to spend some quality time with your mom or dad before you get married! You can do a simple routine or a high energy dance to start the party. The options are limitless. What do your dance lessons include? Want a memorable dance that will leave your guests impressed? Some couples want to wow their guests with something a bit more complicated …we can make your vision come to life! Do you love dancing with the stars or want a dance like the one in Ed Sheeran's video; “Thinking out Loud?” We can create a dance with lifts and more advanced moves that will leave a lasting impression on you and your guests long after the wedding is over. Want a traditional classic dance? Maybe you want something simple and understated. You may not like to be the center of attention but you want to look like you know what you’re doing. You may not want the pressure of remembering complicated dance moves. We can make your dance simple and elegant with a few moves like some turns and dips that will be easy to remember and fun to watch. Maybe you want a little bit of everything in your dance: romance, simple elegant movements to a slow song that’s meaningful to you and your partner, but then you also want to mix it up with some fun party dance moves…you can choose a mash up of songs, for instance you could start with a slow dance, then bust out into a fun hip-hop routine to kick off the dance party! Anything is possible. We can bring your vision to life.